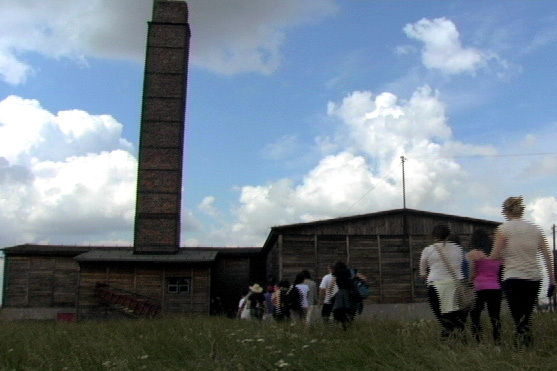 Leo Zisman and group walking away from Auschwitz as seen in THE LION OF JUDAH, a film by Matt Mindell. Picture courtesy JEC Productions. All rights reserved. 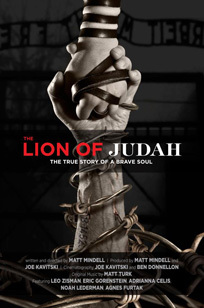 JEC Productions and New York's QUAD Cinema present the New York Theatrical Premiere of Matt Mindell's THE LION OF JUDAH (60 minutes) on August 10, 2012. Winner of the Los Angeles Movie Awards' Award of Excellence, THE LION OF JUDAH marks a crucial shift in tone of voice for Holocaust remembrance--a confident, vibrant, in your face response to time running out for the last generation of Survivors who feel a sense of urgency to tell their stories. Leo Zisman, already had enough of Nazi cruelty when it first asserted itself in his life 75 years ago. Zisman is the kind of man who, as a boy, when faced with a Nazi death camp guard who held a rifle to his head, fearlessly shouted at him in German, "Shoot...shoot...you pig!" Leo "Laibel" Zisman and his brother were the sole survivors of a prominent family from Kovno, Lithuania. After the War Zisman became an engineer, built a successful real estate business, and raised his family of five. His recently published memoir, I Believe, is a testament to resilience, determination and his return to observant Judaism. Now 81, Zisman is committed to taking young men and women, Jews and non-Jews, through the past he lived. THE LION OF JUDAH chronicles his uncensored tour along with 36 participants, the most reprehensible of the death camps--Majdanek, Birkenau and Auschwitz. Those who join Zisman are similarly outspoken, including a young Columbian woman, Adriana Celis, a Catholic who had always been drawn to Judaism. Going so far as to enroll as a Jewish Studies major at University, one of her professors remarked to her, "I think you're Jewish." She doubted it, but upon research discovered that she was indeed Sephardic on both her mother's and father's side. 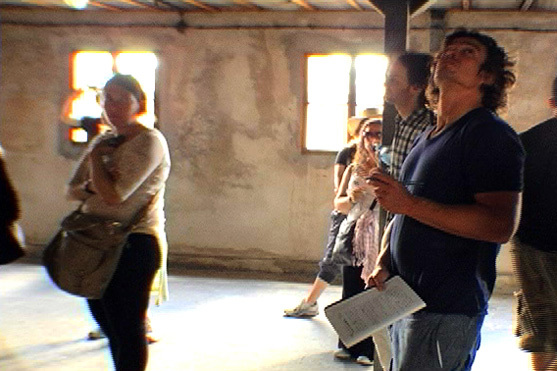 Refracted through the young Jews like Celis, and Noah Lederman whose great aunt and uncle were murdered in Majdanek who joined Zisman on his tour, the film tells its basic story from multiple points of view and hauntingly asserts how quickly a man can go from being part of a community to a mass grave. In its vox-pop style the film surveys contemporary Poles, illuminating attitudes and unmasking memories. Underscoring the narrative is the certainty that all of this could happen again, a view made indelibly clear when, on a street in Cracow filmmaker Mindell and a Polish journalist interview two young religious Jews, openly wearing their yarmulkes and tzitzis while they have been touring Eastern Europe. In the midst of assuring us that the Poles had never once shown them the slightest sign of antagonism, a young Pole passes by, spitting out anti-Semitic slurs. Even some of the most well-meaning Poles who appear polite and contrite in the film, insist the past is past and slip easily into scape-goating and stereotyping. Other young Poles like radio personality Tomasz Kosiorek, who invites Mindell on his radio program on Polski Radio work and plead for understanding. "We have to know each other better." Mindell, a former Northeastern Regional Director of Steven Speilberg's Survivors of the Shoah Visual History Foundation, where he spearheaded the collection of audio-video testimonies of "Spiritual Bravery", was struck by Zisman's charismatic personality and story and invited him to teach a course at his Jewish Enrichment Center (JEC) in Manhattan where he serves as Executive Director producing cultural events and conducting educational trips to Eastern Europe and Israel. After telling his story to Mindell and students, Zisman's wife, Myrna plainly said, "We should go!" Two months later they were on their way to Poland. Mindell produced THE LION OF JUDAH with Joe Kavitski, who, along with Ben Donnellon, also served as a cinematographer. Kavitski, a non-Jew, was so moved by his experience that he has begun teaching a course about the Holocaust to New Jersey Middle School students. In fact, the majority of young participants who joined Zisman have made major changes and commitments in their own lives helping to enlighten others unfamiliar with this dark period of history. Original music for the film was created by Matt Turk. All profits from film will be used by the JEC to sponsor additional educational trips for Holocaust and genocide awareness. Following it's theatrical run, THE LION OF JUDAH will be distributed through Netflix, iTunes and other major digital platforms. Matt Mindell is the writer, director and producer of The Lion of Judah (2012), a documentary that tells the story of Holocaust survivor Leo Zisman, who leads a group of young adults on a journey through humanity's darkest period. The film's powerful message inspires viewers to gain the courage to change the world for the better. He is also the Executive Director of the non-profit Jewish Enrichment Center (JEC) in Manhattan, where people in their 20s and 30s come together to learn, socialize, and become inspired by participating in such activities as taking classes on Jewish philosophy, studying Hebrew and traveling to Israel. A graduate of the NYU Tisch School of the Arts with a major in film and acting, Mindell previously starred in several commercials for major brands including Doritos, LA Gear and Clearasil. He also appeared on Saved by the Bell, and in several movies including Big and Change of Seasons with Eli Wallach. After starring in The Survivor, a play based on a Jewish gang that fought the German army in the Warsaw Ghetto, he was inspired to learn more about his Jewish identity. He journeyed to Israel, where he fell in love with the land and its people. A few years later, he returned to New York as the Northeastern Director of Steven Spielberg's Survivors of the Shoah Visual History Foundation, where he spearheaded the documentation of "Spiritual Bravery," an oral history of the religious traditions upheld by Jews who were imprisoned in the concentration camps. It was this experience that led him to found the JEC, home of the Birthright Israel Alumni program. Joe Kavitski is a New York City filmmaker and artist interested in exploring dark and challenging subject matter and the therapeutic aspects of the arts. A recipient of the Ithaca College Cinema and Photography Department Faculty Award, his film, Surrendering Serendipity: A Rock Opera, won 1st Place in the Comedy/Musical category at the 2006 Ole Muddy Film Festival and the Originality Award at the 2006 Pocono Mountains Film Festival. In 2010, he edited T-3-Z-A-Poppin' II, which won 1st Prize at the National Creative Arts Competition. Recent projects include The Lion of Judah, a 60-minute documentary about a Holocaust Survivor returning to concentration camps in Poland and Prague to tell his story to the next generation, and Krazdale, a comedic web series co-created with Ben Donnellon that follows the lives of two friends as they battle through the struggles of meeting women, living in New York City, and spontaneously traveling through time. Joe is currently finishing production on his first feature-length film, Nightmarriage, an experimental narrative deconstructing the bonds of matrimony, and The Mural Project, a short documentary about residents of a nursing home living with Alzheimer's disease who paint a mural in their recreation room. Ben is co-founder of The FilmShop; a non-profit organization composed of independent filmmakers and media producers dedicated to developing new, groundbreaking work through collaboration and collective development. The film collective has produced over 100 films and holds screenings two times a year. Over the last couple of years, Ben has shot short documentaries in Israel, Morocco, Ukraine, Cuba, Mexico, and most recently Poland and Prague for Lion of Judah. He has directed six music videos and three short films. His current projects include writing and directing for the new web series, Krazdale, cinematography for a feature length experimental film, Nightmarriage, directed by Joe Kavitski, and production of his first feature film, Know Your Logic, currently in post-production. Musical Renaissance man Matt Turk is a veteran performer who has engaged audiences around the world, both as a hard-rocking bandleader and an acoustic folk troubadour. He has shared the stage with Bob Dylan, Pete Seeger, Norah Jones, the Dave Matthews Band, the Grateful Dead's Mickey Hart and Phil Lesh, Hot Tuna, Richie Havens, Fiona Apple, The Doobie Brothers, Ellis Marsalis, NRBQ, and many more. He has performed and toured throughout the U.S, Israel, Europe, Latin America, and the Caribbean, and appeared at scores of prestigious festivals and venues, including Clearwater's Hudson River Revival, the Gathering of the Vibes, the Berkshire Mountain Music Festival, Atlanta's Music Midtown, The Beacon Theater and Tarrytown Music Hall. In 2011, he showcased at the Folk Alliance International conference in Memphis, TN. Matt's latest record, American Preservation, which hit Number #20 on the folk/dj charts, is a collection of traditional standards and well-loved classics, ranging from Roy Acuff to Pink Floyd, and from Taj Mahal to T. Rex. Matt's version of "America the Beautiful" has been called "arguably the definitive acoustic version" by Music News Nashville. Turk has also lent his considerable musical chops to movie soundtracks. His cover of the seasonal classic "God Rest Ye Merry Gentlemen" appeared on the soundtrack to the 2007 Warner Bros. film "Fred Claus." Turk provided lead vocals, mandolin, lap steel and acoustic guitar on the track. In 2006, his original song "Bette Says" appeared on the CBS television show "Love Monkey". He has also recorded music for the History Channel and other television, cable and Internet stations. Leibel "Leo" Zisman is the main subject of The Lion of Judah (2012), a new documentary written and directed by Matt Mindell. In the film, Zisman leads a group of young adults back to Poland and Auschwitz, where he suffered through humanity's darkest period. Through this journey, he hopes to help the next generation better understand the incomprehensible, and turn their knowledge into action that can help end genocide forever. Zisman is also the author of I Believe, The Story of One Jewish Life (2011). The autobiography tells the story of his long journey from Kovno, Lithuania, where as a young boy he was uprooted by the Nazis and forced to move to the Warsaw Ghetto. Zisman was then separated from his family and sent to the Stutthof concentration camp in Poland, and from there to Auschwitz where he survived the war. After being liberated, he made his way to the United States, where he soon prospered. He spent the majority of his professional life running Elzee Construction in Brooklyn, and became a well-known builder and developer throughout New York City. Leo has received rabbinic ordination from the United Lubavitch Yeshiva, and has degrees in mathematics, architecture and engineering. He was also a professor of math at the CUNY School of Engineering. 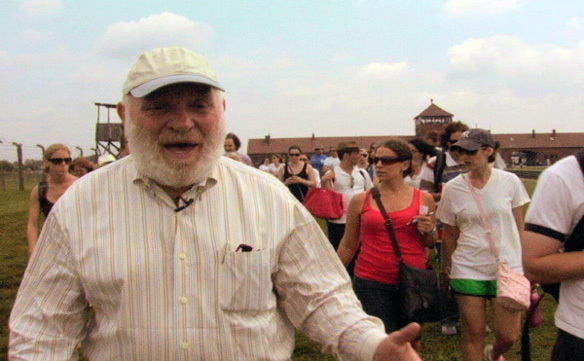 In 2005, he returned to Auschwitz to speak in front of thousands of young adults at the 60th commemoration of the camp's liberation. He continues to spend the majority of his time telling his tale of suffering and tremendous perseverance to younger generations, through speaking engagements as well as education trips for Holocaust and genocide awareness. THE LION OF JUDAH, a film by Matt Mindell. Poster image © 2012 Stan Lebovic. Courtesy of Stanley Aaron Lebovic. All rights reserved. Adrianna Celis as seen in THE LION OF JUDAH, a film by Matt Mindell. Picture courtesy JEC Productions. All rights reserved. Filmmaker Matt Mindell and Agnes Furtak as seen in THE LION OF JUDAH. Picture courtesy JEC Productions. All rights reserved. At the cemetary as seen in THE LION OF JUDAH, a film by Matt Mindell. Picture courtesy JEC Productions. All rights reserved. 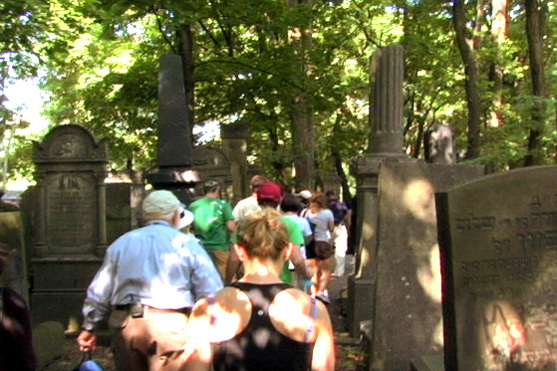 Filmmaker Matt Mindell looks at a grave as seen in THE LION OF JUDAH. Picture courtesy JEC Productions. All rights reserved. Walking into the cremetory as seen in THE LION OF JUDAH, a film by Matt Mindell. Picture courtesy JEC Productions. All rights reserved. Noah Lederman looks into a gas chamber as seen in THE LION OF JUDAH, a film by Matt Mindell. Picture courtesy JEC Productions. All rights reserved. Noah Lederman and others lighting candles as seen in THE LION OF JUDAH, a film by Matt Mindell. Picture courtesy JEC Productions. All rights reserved. The sun burns your eyes. A woman loses her mind. A girl sings in a honky tonk. A Chinese man on opium dreams. Running after a child through the jungle. Lightning. Directed by Chito Rono and stars Vilma Santos with Kim Chiu, Pokwang, Janice de Belen, Martin del Rosario and Mark Gil. A maverick New York hedgefund trader with uncanny analytic abilities moves to Hong Kong and orchestrates a mega-deal that swiftly escalates beyond his control.